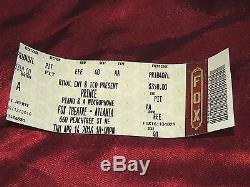 But the Piano and Microphone Tour at the Fox Theatre in Atlanta on April 14, 2016 at 10pm. This was a seat in the Orchestra Pit, which was basically 5th row on the left side of the stage. Anyway, the ticket is untorn. It actually was used to get into the show,, but they apparently don't tear the tickets any longer, so it is still in new condition. I uploaded higher quality pic so hopefully you can judge the condition well. There is some bends and a little creasing on the right side that you should be able to see in the pic. Check out my other items if you like. If you have any questions or would like additional pictures, please let me know. And on a personal note, Prince gave an incredible performance at these two shows and seemed very happy. He said on this past Saturday at Paisley Park that he wanted to release this 2nd show as a live album when the tour was done. He was just very passionate during it and the Atlanta crowd gave him a lot of love. I truly believe his last show was a very special one for everyone there. Prince will live on through his music and continue to bring joy to so many more people in the future. 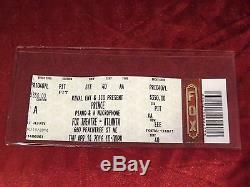 The item "Prince Piano & A Microphone Tour Final Concert show Ticket Stub Atlanta 10pm" is in sale since Friday, April 22, 2016. This item is in the category "Entertainment Memorabilia\Music Memorabilia\Rock & Pop\Artists P\Prince\Other Prince Memorabilia". The seller is "birdsnshells" and is located in Duluth, Georgia. This item can be shipped worldwide.